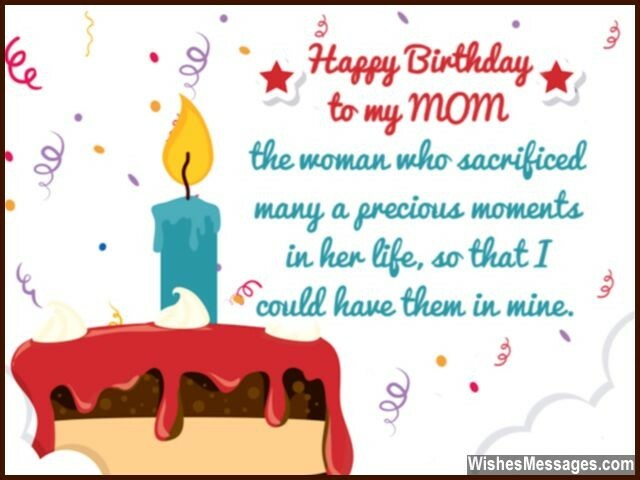 Birthday Wishes for Mom: Whether you’re a preteen, teenager or a grown up adult – never cheap out on the way you wish your mother a Happy Birthday. Mums deserve the sweetest messages, the cutest hugs and the most touching greetings. Put your petty fights aside and think about all the sacrifices she’s made for you. In the lead up to her birthday, barrage her Facebook, Twitter and Pinterest with quotes and notes. Make a collage of your childhood pictures and share it on your Instagram. Buy a nice gift and make her feel like the luckiest mother in the whole world. Rally around her to make her feel special in every way. Give her a reason to believe that she has much more than just a son or a daughter – children who truly value the love that she has for them. 1) Happy birthday to my mom… the woman who sacrificed many a precious moments in her life, so that I could have them in mine. 2) No matter what I’ve said but deep down in my heart, you are the one I look up to, stay true to and love coming back home to. Happy birthday mom. 3) The awesome memories of my childhood have become my shadow. They follow me wherever I go, and I hope it never stops being so. Happy birthday mom. 4) If I can grow up to become even a LITTLE of what you are, I will consider myself to have achieved a LOT. Happy birthday mom. 5) As a rebellious teen I hate doing ANYTHING with you but at the same I time deep down inside my heart I know that I’d have been NOTHING if it weren’t for a mom like you. Happy birthday. 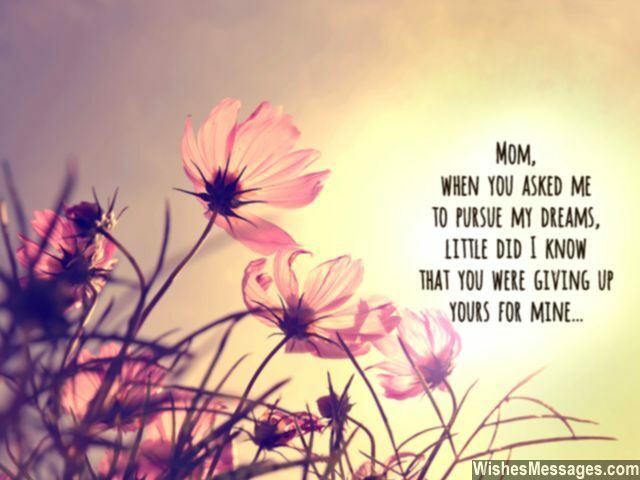 6) Mom, when you asked me to pursue my dreams, little did I know that you were giving up yours for mine. Thanks, happy birthday. 7) When you told me what to do, I thought you were bogging me down. But in hindsight I realize that you were actually giving me wings. Happy birthday. 8) Mom, all this time I cursed you for trying to change who I was, only to realize in hindsight that all you were only encouraging me to be who I really am. Happy birthday. 9) No matter where you are, no matter what you’re doing… home will always be where your mom is. 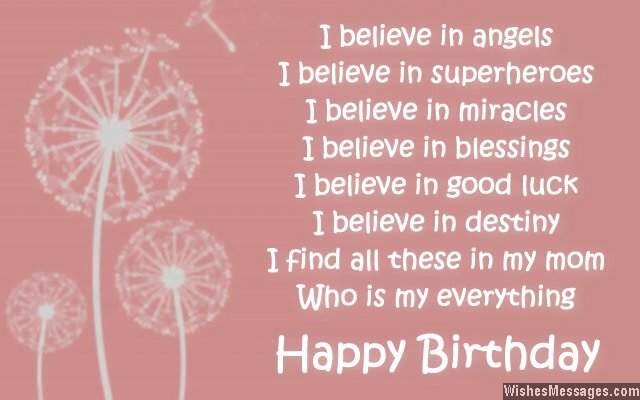 I believe this, happy birthday ma. 10) Like the ground beneath my feet, all the love and care you’ve put into my life has turned into a foundation that will support me as I walk life’s twists and turns. Thanks mom. 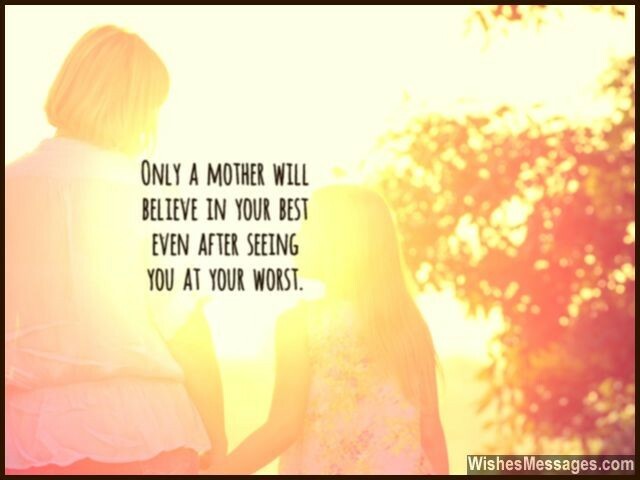 11) Only a mother will believe in your best even after seeing you at your worst. 12) No one else is as lucky as me, because I’ve got a mom as awesome as you. Happy birthday. 13) The stuff you bake is good to be true, but not even half as sweet as you. Happy birthday mom. 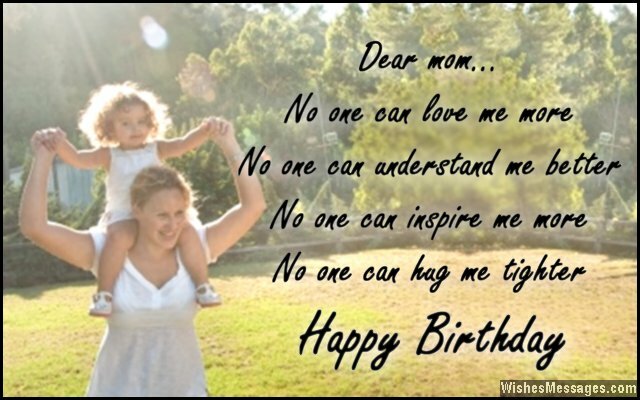 14) Mom, all your life, your prayers have always been for our happiness. Today, my prayer is for you. Happy birthday. 15) Like how the flowers get a new lease of life in spring, you’re the one who has fixed my broken wings. Happy birthday mom. 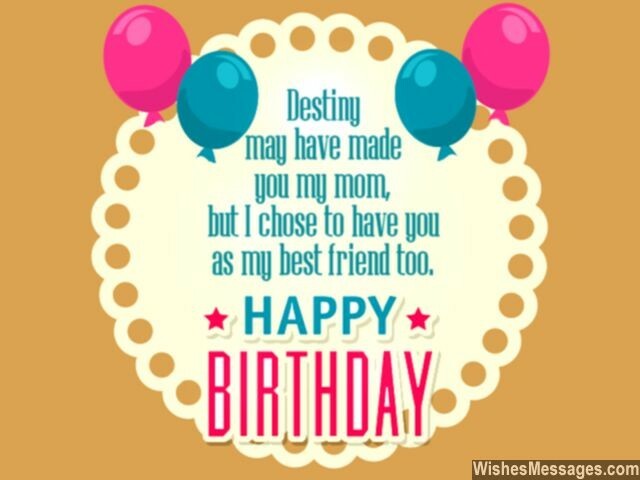 16) Destiny may have made you my mom, but I chose to also have you as my best friend too. Happy birthday. 17) Mom, I always thought that your expectations from me were annoyingly sky high. But now I realize that your sacrifices you made were so much higher. Happy birthday. 19) Life hasn’t been fair but I’m willing to trudge it all, because I have a mom who given it all up for me. Happy birthday. 20) Happy birthday to the woman who I never allow to touch any of my things. Ironically, she’s also the one who I always ask when I can’t find some of my things. 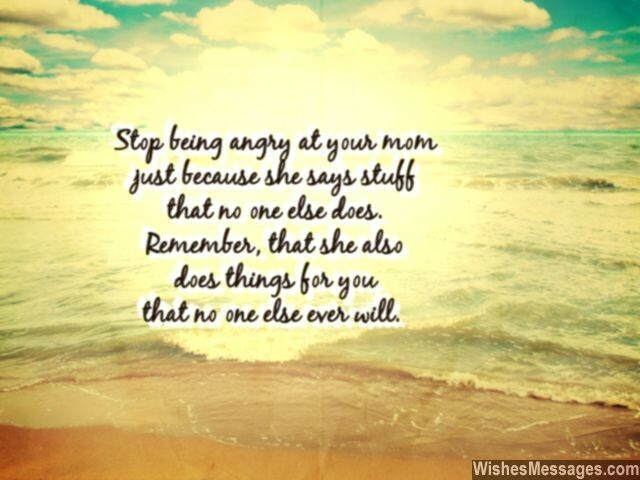 21) Stop being angry at your mom just because she says stuff that no one else does. Remember that she does things for you that no one else ever will. That’s what I’ve learnt when I’ve looked back at my childhood. Thanks ma, happy birthday. 22) Mom, sometimes I may not like you. But never let my moods make you feel that I don’t love you. Happy birthday. 23) A perfect mother, is a woman who is exactly like my mom. Happy birthday. 24) You are the best mom ever, and like you there can be no other. Happy birthday mommy. 25) Everyone else calls you my mom. I call you my BFF. Happy birthday. 26) No one can love me more, no one can understand me better. No one can inspire me more, no one can hug me tighter. Happy birthday. 27) Mom, we’ve fought a lot but I promise that below the surface of my rants is a bottomless ocean of love for you. Happy birthday. 28) When I wasn’t being true to my own self, you told me to listen to my heart while others were egging me on to do stuff that I never wanted to. Thanks mom. 29) Today I have a proposal for you that on your birthday – you can scold me all you want. In return, on my birthday you can gift me all you want. Happy birthday mommy. 30) Unlimited, non-refundable and free, is the kind of love that exists between my mother and me. I love you mom. Happy birthday. 31) I believe in angels, I believe in superheroes. I believe in miracles, I believe in blessings. I believe in good luck, I believe in destiny. Because I find all these in my mom, who is my everything. Happy birthday. 32) May your eyes always be free of tears, is what I wish as your birthday comes near. Love you ma. 33) If motherhood had to be explained to someone without giving your example, it would be a worthless definition. Happy birthday mom. 34) Forget the movies, mom you are my real-life hero. Without you, my life’s worth would have been zero. Happy birthday. 35) Mom, because of you, I became me. I love you so much mom can’t you see? Happy birthday. 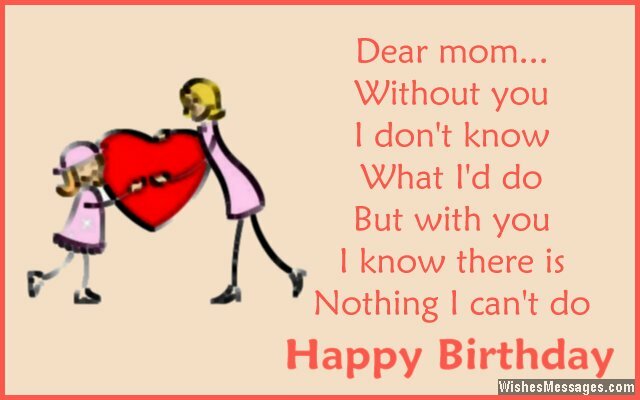 36) Dear mom, without you, I don’t know what I’d do. But with you, I know there is nothing I can’t do. Happy birthday. 37) The safest and the most trouble free place in the world is my mom’s hugs, made exclusively for me. Happy birthday mommy. 38) You’ve always been the wind that helped the boat of my life sail through high tides, choppy waters and endless storms. Happy birthday ma. 39) Your hugs, which I once thought to be lame and uncool, are now what I miss the most. Happy birthday mom. 40) Life isn’t perfect but I’m okay with that. If fate can give me a mom as awesome as you, I already know that I’m luckier than anyone else out there.